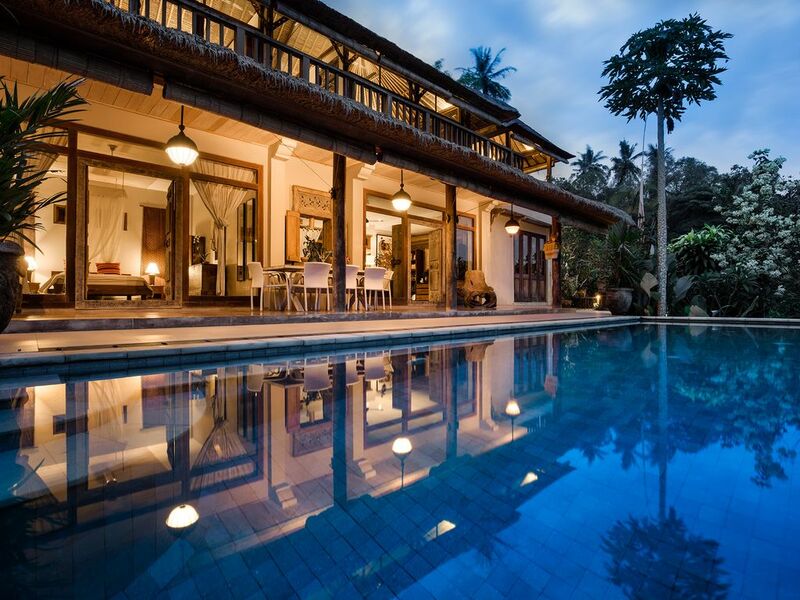 Villa Sagitta, situated in Pejeng, Ubud in Bali, 7km from central Ubud, can be rented as a 3-bedroom villa (sleeping up to six people) or as four bedrooms, sleeping up to eight people. There is also a baby cot, and a camp cot, available for infants and small children at no extra charge. It is a 15-minute drive (through beautiful rice field scenery) to central Ubud, and the villa is equally close to most of the sites that visitors come to the Ubud area to see - such as Goa Gajah, Tirta Empul and Gunung Kawi. Villa Sagitta is about peace, relaxation and serenity. It is positioned at the top of a river gorge, in a newly declared UNESCO World Heritage site. There are magnificent views across the indigenous Balinese forest. The villa has its own private temple on the property, as well as a beautiful ancient temple 100 metres away. Immersed in spirituality, it is impossible not to relax! The double storey villa is beautifully furnished in an eclectic mix of contemporary design and carefully selected Balinese antiques. The Joglo Suite is situated slightly away from the main house as a separate pavilion. It is made entirely of wood and has intricate carvings on the ceiling. We have enclosed it with walls on three side but the front has been left open to embrace the magnificent river valley views. The bathroom is outdoors but covered. The shower is completely private but open to the stars. We can promise you a truly unique experience when staying in the Joglo suite. •	A car with a reliable and friendly driver, with good English, is available throughout your stay at a competitive price. No need to lift a finger while staying at Villa Sagitta! Our staff members are there to ensure that your holiday is as stress-free, hassle-free and relaxed as it should be, while affording you privacy at all times. The Balinese are well known in the international hotel trade for their exemplary levels of ‘intuitive service’, and the staff at Villa Sagitta is no exception. Our team will happily organise – among other things – transport, excursions, restaurant bookings and spa treatments. A complimentary breakfast from our breakfast menu is provided throughout your stay. Food is such an interesting, and delicious, part of a Balinese holiday that we offer a a simple à la carte menu of Balinese and international cuisine which is prepared by our staff. Villa Sagitta does not offer self-catering, although the staff are more than happy to show you how they prepare the traditional Balinese dishes that we offer. Our beverage list, for your account, includes both non-alcoholic and alcoholic drinks. Tea and coffee is complimentary, as is bottled water from the water dispenser. Safe ice is always used. In addition we will endeavour to accommodate any dietary requirements or additional beverages which are not on our menu, where possible. We are happy to organise your airport transfer, or your transfer from elsewhere on the island. The rate to or from the airport is Rp400 000 (approximately US $28) for a seven-seater vehicle. Children are very welcome at Villa Sagitta but the property is not suitable for mobile babies and toddlers, or children who cannot yet swim, as there is an unprotected swimming pool and parts of the garden are steep. No Balinese holiday is complete without a spa treatment or two! We provide well-priced in-house treatments which can be arranged with the staff or, alternatively, our staff will be happy to book treatments for you at surrounding spas – many of which provide a complimentary pick-up service from the villa. David and Mailie are the owners of Villa Sagitta, as well as Villa Cocoa Maya in Candidasa in eastern Bali and Villa Bebek in Seminyak and The Lookout at Whale Cove in South Africa. We’ve always been keen travellers so, school schedules permitting, we try and spend as much time at our properties as we can with our two boys. But, because life tragically can't be one long holiday, we rent our properties out to guests as well. The villa is beautifully situated at the top of a river gorge. There is a special light that settles over the gorge in the mornings and evenings, and my absolute best is to curl up in the upstairs bale, or on the day bed outside, with my book and a cup of coffee, and just imbibe the views, and sounds, of Bali. Ubud really is the cultural heartland of Bali and we love the arty, laid back feeling of the whole area. We particularly loved this property (and we looked at many!) because it provides such a sense of serenity, peace and tranquility. The drive to Ubud – through the most gorgeous rice fields – is really beautiful. We enjoy that we are close enough to the ‘action’ to easily partake in Ubud life and the attractions in the area. Yet, equally, we often just lounge around the villa for days on end doing nothing but swim, sleep, read and eat! Heaven! We have tried to make Villa Sagitta as appealing for our paying guests as it is for us. This is not your typical rental home – we love to collect art and different pieces, and we like to live comfortably! We hope the villa reflects this for you as well. Our 200 year-old Joglo suite is relatively unique - even by Balinese standards. We had a really good time finding beautiful antiques to furnish it with - we hope you love it too. All four bathrooms are en-suite. The Joglo Suite bathroom has a basin and toilet with an open-air shower. The main bathroom has an undercover outside shower as well as an enclosed indoor shower, two basins and a toilet. The second bathroom has an enclosed toilet, a basin and an open-air shower. In typical Balinese style both bathrooms, while protected from the elements, are not entirely closed to the outdoors, so you can enjoy the views and the sounds of nature while showering. The third bathroom is enclosed and has a shower, toilet and basin. There is air conditioning throughout the villa except in the Joglo Suite where there is a ceiling fan, two standing fans and natural ventilation. High thread count cotton linen is used throughout. Both bath and swimming towels are provided. The living room is equipped with comfortable sofas, a day bed, a TV, DVD player and music system. The villa is not self-catering, however the kitchen is available for your use to store anything you like there. There is also a self-service drinks fridge in the kitchen. The weather in Ubud is always warm enough to eat outside. The dining room table is positioned under cover. We have an Indosat package with extensive channels. We have a large tropical garden. It is steep in parts. The main bedroom upstairs has a beautiful outdoor undercover bale where you can lie and relax. Great place in the country yet convenient to the sites of Ubud. Staff, facility and services were fantastic. Highly recommend! We loved our stay in the villa, that lies beautifully in the rain forrest and is bigger than it seems on the pictures. Staff is very kind and effective, when arranging eg. transport and massage. Breakfeast and the cook's food is delicious. My husband and adult daughter and I spent three days here. It is a beautiful villa, and the pictures are accurate. The menu is more than adequate, and the staff was kind enough to stay late to prepare our dinner upon our arrival, which was much appreciated. The infinity pool is a real plus; looking over the edge of the pool into the forest across the gorge is a memory I will not soon forget. We were there during the full moon Ceremony celebrations, which included an hour and a half of drum beatings and other celebratory music, which was loud enough to make conversation difficult on the balcony. Not a huge problem, but perhaps worth checking your travel schedule. Very helpful and attentive driver, Ketut. Our thanks to him. (very reasonable rates). We enjoyed shopping in the Ubud market (remember to bargain, and don't miss the beautiful Balinese glass mosaic tile dishes; they are beautiful!). My daughter and I enjoyed a spa day at the Oops spa. The foot massage is worth having! We would definitely recommend this villa. Peaceful, beautiful, unique - Jungle Paradise! We were blown away by the unique views of the jungle, the beautifully kept gardens and tasteful interior design of Villa Sagitta. Our 4 night stay was just perfect for a family holiday. Sana and the other staff were incredibly friendly and genuine people, and they made us feel relaxed and safe the entire time. They assisted promptly with drivers, tours and special food requests - all with a giant smile and kindness. The villa is incredibly well maintained and the pictures seen on the website really do not truly represent how incredible the place is - it is utterly peaceful and even the roosters blend in with the tranquility. Everything seems to slow down and you can appreciate the amazing views of the jungle from the pool, and we even requested a private massuer for one of the days to come to the villa. We wish we stayed longer - we will not forget this paradise. Thanks to all who helped us have an amazing stay. There is plenty to see and do in Ubud. Well known as the cultural heart of Bali, Ubud is beautifully situated among picturesque rice paddies. Despite the increasing numbers of tourists, Ubud still retains its charm. It is well known for its good shopping, excellent restaurants, fantastic spas, and many spiritual practices and varied courses. It is also famous for performances of mesmerizing traditional dances such as the Barong, Kecak and Legong dances. The villa staff will be happy to make suggestions regarding yoga, meditation, cooking classes, art classes, dance classes, sightseeing, bird walks, herb walks and anything else you can think of! The villa has access to many activities both close by and further afield, with the advantage of being able to return to peace, quiet and tranquillity. Pejeng, where the villa is situated, is very famous for its temples and was once an important seat of power. With over 40 old temples in the region between the rivers Pakrisan and Petanu, the Pejeng area contains Bali's richest collection of antiquities. Most antiquities are in the form of worn statues kept in important temples in the area. Some of Bali's archaeological treasures, such as Goa Gajah, Gunung Kawi and Pura Pusering Jagat, which date as far back as the 9th century, are also situated in this area. There are many archaeological odds and ends in this 'Valley of the Kings' in the middle of Pejeng - known as Bali's rice belt. It's a nice walk to the 14th-century cut-rock 'candi' at Kalebutan near Tatiapi, one km west of Pejeng Timor. There are many beautiful walks in Pejeng through the rice paddies. If you prefer our driver (included in your rate) can drop you off and collect you, where and when you please. Various operators offer rafting on the Ayung river near Ubud. The Ayung River caters to class 2 and 3 rapids which are suitable for anyone from 5-75yrs. Cycling is a beautiful way to see the Balinese landscape and there are tour operators who offer cycling tours for different expertise and fitness levels, and also tours that include children. In fact many of the cycling tours pass very near the villa and you can be fetched from the villa to start your cycle. From Pejeng to central Ubud the cycling is mainly downhill. Goa Gajah, a significant Hindu archaeological site, is a 10 minute drive from Villa Sagitta. It consists of a mysterious cave, relics, and ancient bathing pools set amid green rice paddies and a garden. Goa Gajah is colloquially known as the Elephant Cave because of its close proximity to the Elephant River. The entrance to Goa Gajah looks like a demonic mouth, suggesting that people are entering an underworld as they venture inside through the darkness. Some claim that the entrance represents the Hindu earth god Bhoma, while others say the mouth belongs to the child-eating witch Rangda from Balinese mythology. Goa Gajah was listed as a tentative UNESCO World Heritage Site in 1995. Tirtha Empul Temple is a Hindu temple, built in 926 A.D, during the Warmadewa dynasty (from the 10th to 14th centuries), at a site where there was a large water spring. It is famous for its holy water and this is where many Hindu Bali people go for purification. It is about a 10 minutes drive from the villa. Tirta Umpul Temple is a very active temple and as such is an interesting place to observe Hindu devotees purifying themselves by means of ritual bathing. It is especially recommended to visit on a full moon day, which has special significance in Bali. The Moon of Pejeng is the largest single-cast bronze kettle drum in the world, and the largest known relic from South-east Asia's Bronze Age period. It dates back to 300 B.C. It is considered highly sacred by local people and is thought to be a relic of early rice cultivation rituals. It is kept at Pura Penataran Asih Temple in Pejeng.